Wildflower Art Studio began when I started my first greeting card-making company in 4th grade. I have always gravitated toward adventure: living on a sailboat in the Caribbean, working as an island-sitter in the Bahamas, attempting a tandem-bicycle ride from San Diego to Canada... It's a long story. In my career as an artist, I have worked for the Savannah College of Art & Design (SCAD) & taught High School Art in Texas. I am currently a full-time artist, entrepreneur and mom of 2 wild boys. We recently moved to the country, where there are fields of wildflowers and a pretty magical treehouse. I have a BFA in Painting and an MA in Art Education. My greatest passion is providing my students with creative tools to share their own stories. In 2016, our DIY Calligraphy Kit became a national best-seller with one of the largest retailers in the world. Our incredible team packaged over 10,000 DIY Kits in my home-- first taking over the dining room, the garage, then basically the entire house. When the UPS man brings your 3 year-old son his own tiny UPS uniform for Christmas, you know the "home business" thing has gone a bit too far. I'm currently in the process of the newest adventure: Opening our first Brick & Mortar! 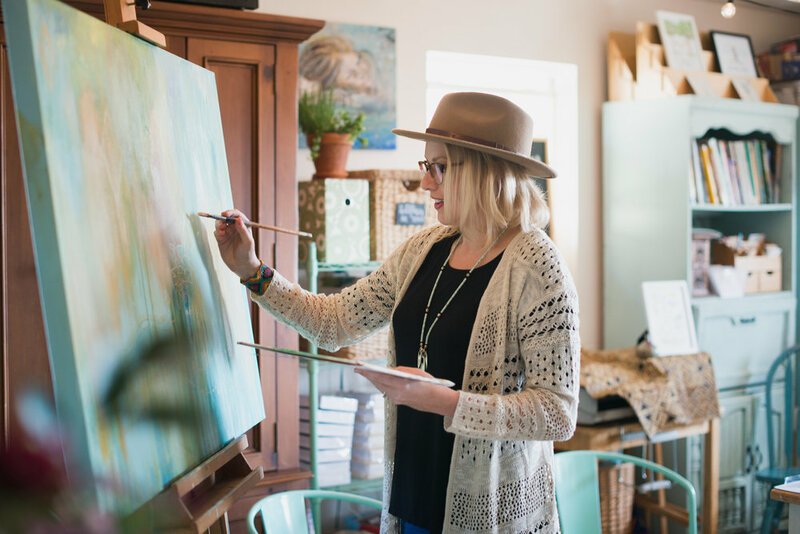 Located in the heart of Denton, we will offer adult workshops, kids classes (and you should SEE the DIY Kit area-- It feels like a castle after finally moving out of the garage). This year, we've added 2 additional best-selling kits to our collection, sharing our passion for creativity with new friends all across the globe. I hope to meet you soon! Join us for a workshop or stop by to say "hi" on Instagram. As our Studio Manager, Bailey oversees the creation of thousands of DIY Kits every month. She manages our studio employees and interns, as well as our Wholesale accounts. She seamlessly ships thousands of kits worldwide... it's basically like traveling across the globe every time she comes to work. Also a talented artist, Bailey enjoys pencil drawing & hand lettering. She shares her love of art with our littlest artists in our weekly art classes and seasonal kids art workshops. When she's not in the studio, Bailey can be found cross-country jumping on her horses or hanging out with her Bloodhound "Junebug". You know, no big deal, just hanging out on a 1000 pound animal while jumping 4 feet in the air. She spent her childhood click-clacking away on a toy typewriter while managing her "paint store"... so this career is really quite fitting. I happen to think she's one of the coolest people in the world... but I may be biased, she's also my sister. Also known as "The Ink Queens" because some part of them is usually covered in Calligraphy Ink... This dynamic duo leads our team through the creation of thousands upon thousands of DIY Kits every year. Madison leads our weekly Kids Art Classes and has plans of becoming a Children's Book Illustrator, while Emma plans to travel the world as a photographer. They are both incredibly talented creatives and their enthusiasm is inspiring. 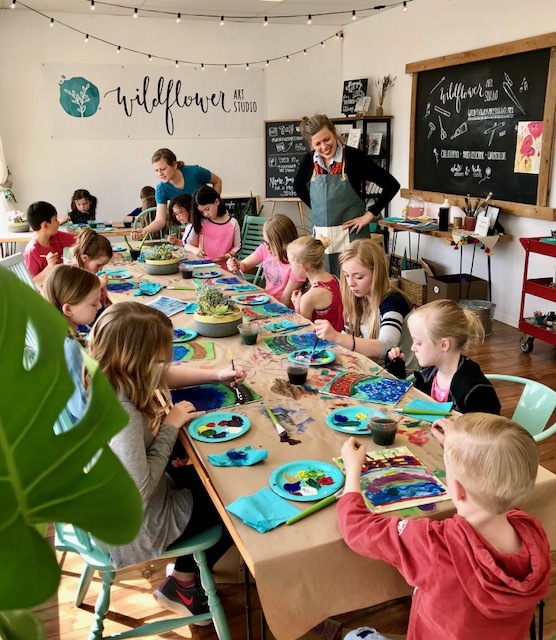 If you're lucky enough to own a Wildflower Art Studio DIY Kit, you can thank these lovely ladies for that little extra dose of magic that's sprinkled inside. Ms. Sherri is the reason our Kids Art Classes are the BEST. Bringing years of experience as an art teacher and a professional watercolor artist, Ms. Sherri is an inspiration! Her love for Children and Art is magnetic. She's talented, full of endless creativity and she also happens to be my Mom.